AZUSA, CA--(Marketwired - Oct 15, 2013) - Wisteria by Christopher Homes is a must-have address for prestigious indoor/outdoor living in Rosedale, one of the country's top-selling master-planned communities. Homebuyers who desire luxury on a grand scale are invited to experience the neighborhood's Featured Home, a Residence 1, Lot #11 that offers an approximate 7,756 square foot oversized lot with a stunning view, along with magnificent interiors to please the most discerning preferences. Priced at $817,195, and slated for a November move-in date, buyers can still customize and select flooring, countertops and bathroom tile for this Featured Home, but timing is everything, so visit now and make this beautiful Wisteria home your own. "Our current Featured Home is the epitome of indoor/outdoor living, with the sprawling lot a perfect backdrop to dine and socialize with family and friends in the naturally majestic surroundings of Rosedale. The included California Room, which extends one's living space outdoors from the expansive great room is the perfect invitation for casual entertaining and relaxing," said Jamie Todd, Director of Sales and Marketing for Christopher Homes. "The interiors of this Residence 1 are equally impressive and showcase four bedrooms, including one on the first floor that includes an ensuite bath. This particular layout is very appealing to buyers with extended family members as well as college students who may still be living at home. The upstairs bonus room is another popular feature, as it offers homebuyers a wonderful space with the flexibility to be transformed in to a game room, teen retreat or study." Additional highlights of Wisteria's 2,887 square-foot Featured Home include 3 baths plus a powder room and a 2-car garage with storage and/or workshop space. A luxury enclave of 68 brand new homes in the resort-inspired backdrop of Rosedale, Wisteria continues to generate incredible sales with prices starting from the $700,000s. 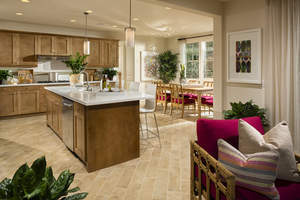 To be on the priority list for first notification of future releases, please register on the Wisteria website at www.livewisteria.com and visit the neighborhood for a personal tour of the professionally decorated model homes. Growing families, mature couples and professionals who are ready to make the move of a lifetime are finding that Wisteria is the perfect address in a thriving master-planned community. Single-family residences range from approximately 2,887 to 3,548 square feet, with 4 to 6 bedrooms, up to 5.5 baths and 2-car garages with storage; plans variously offer an attached private casita and large secondary bedrooms, including some with ensuite baths. Wisteria's optional covered patios ('California Rooms') include sliding glass walls to extend one's living space outdoors. Homebuyers who desire the freedom and flexibility to shape their home will find Wisteria's first-level bedroom suites and convenient home offices, along with upstairs lofts and bonus rooms ideal spaces as their needs change. Wisteria's Residence 2 and 2X offer a standard downstairs master bedroom suite that will delight homebuyers who favor this desirable first-floor convenience, while the Residence 2X also showcases a second master bedroom suite upstairs. Residence 3 offers an approximate 360 square-foot, private three-room casita just steps from the activity core of the home, an outstanding layout for families with college students or relatives living with them. Nestled in the foothills of the San Gabriel Mountains, amidst 518 sprawling acres, including 290 acres set aside for open space, Rosedale offers a classic environment of walkable new home neighborhoods amid a backdrop of park and plaza spaces. Recreational activity includes The Resort, a 4,500 square-foot private clubhouse and two-acre recreation center, the future 5.5-acre Promenade Park and nine neighborhood parks. Situated near the I-10 and 210 Corridor, Rosedale is a tranquil retreat that is easily accessible to urban Los Angeles. The future Metro Gold Line boarding station slated for completion in late 2015 will also provide another transportation option and will be within walking distance for residents of Rosedale. Inspired by the past with its focus on the future, Rosedale is the newest and finest master-planned community for brand new home living in the San Gabriel Valley. For more details, please visit www.LiveRosedale.com. Christopher Development Group and Christopher Homes are privately held companies with offices in Newport Beach, California. They have a 40-year history of building new homes and master-planned communities throughout Southern California. Founder, President and CEO Christopher Gibbs has been directly responsible for more than 15,000 new homes with credits for the Huntington SeaCliff planned communities in Huntington Beach, Westridge in La Habra, Torrey Hills and Santaluz in San Diego. Christopher Homes is currently building coastal luxury townhomes at Pacific Shores in Huntington Beach from the $700,000s to the mid $1 millions. Christopher Homes is known for residential building excellence. Visit www.christopher-homes.com for more information. To visit Wisteria's Models and Sales Center from Pasadena, travel the I-210 east and from San Bernardino and Riverside counties, take the I-210 west. Exit Azusa Avenue and head north into the foothills. Turn right on Sierra Madre Ave., then turn right again on Vosburg Drive and follow the signs. Wisteria is open Monday from 1 p.m. to 6 p.m. and Tuesday through Sunday from 10 a.m. to 6 p.m. For more information, call 626-804-7600. Prices are effective as of the date of publication.